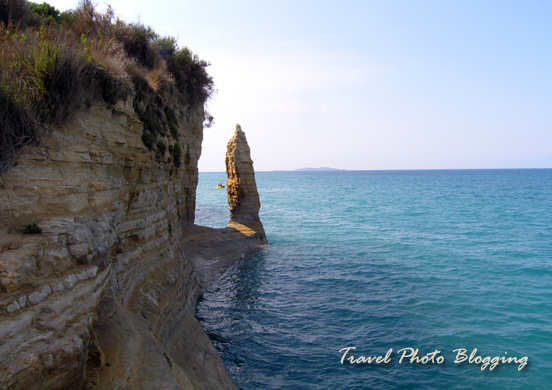 Corfu is known as the greenest Greek island and not as the one with the prettiest beaches - the nearby Zakynthos, Cephalonia and Lefkada are usually mentioned in this context. 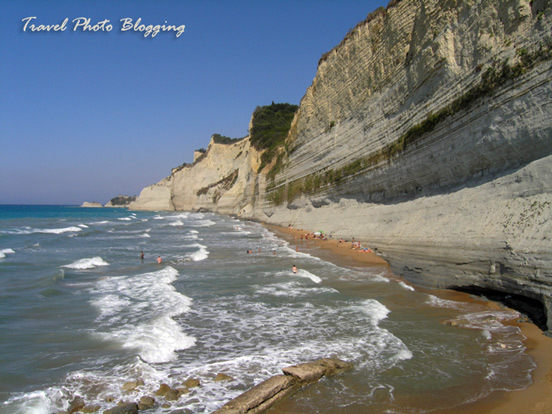 I was visiting Corfu for the first time and I was expecting to see at least some nice beaches. Let me just say I was not disappointed with what I saw. Since we were stationed in the town of Ipsos (North-Eastern part of the island) and renting scooters, we mainly concentrated on the northern part of the island. I particularly enjoyed Logas Beach near the village of Peroulades. There is even a cute café/restaurant (7th Heaven Café) at the top of the cliff overlooking the beach. However I have to point out that when we were there a strong wind started blowing in the afternoon and high tide literary flooded those few meters of this cute sandy beach under high cliffs. I am not sure if this is something that happens there every day, but could be quite inconvenient getting there just to find a flooded beach. If you find yourself in a situation like that, I suggest to take it easy and order a cocktail or two at the panoramic bar on the top of the cliff. I am sure you'll feel much better afterwards. A bit harder to get to is Myrtiotissa beach, located nearby the much more popular and usually overrun with tourists - Glyfada beach. The road leading to this beach is quite narrow and steep. There is a beautiful Monastery of Virgin Mary Myrtiotissa located just above the beach. It is quite isolated, unorganized, pretty much unspoiled and unofficially nudist. You can easily find your almost private spot behind one of many large boulders scattered on the whole length of this beach. Another beach worth mentioning is Sidari Beach with the famous coves of Canal d'Amour located to the west of the town of Sidari. The main part of the beach can get quite busy and loud. If you walk to the cliffs on the western part of the beach, chances are you will find a place to enjoy by yourself. However getting there will probably include following a path through some bushes and jumping off a cliff to get to the sea. For me this was just perfect. There are also many other popular beaches we didn't visit on purpose. We tried to avoid the most popular and crowded ones. If those are the ones you are after, you should definitely visit the above mentioned Glyfada (large surface of fine sand, surrounded by tree-covered cliffs), Paleokastritsa (surrounded by green cliffs and many sea caves that can be visited by boat) and Agios Gordios beach (a sandy beach, surrounded by impressive rock formations, greenery and tourist facilities). 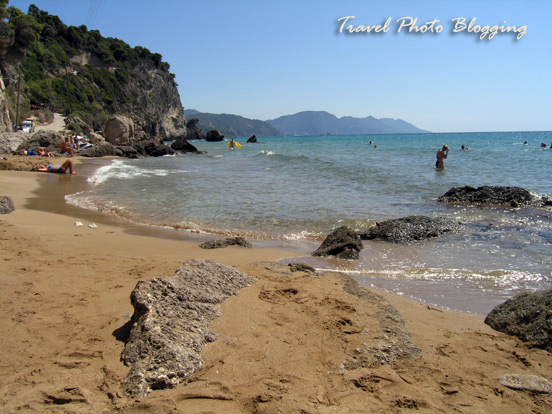 Since these are just some of the beaches on the northern part of Corfu island it is obvious the island is well worth visiting it even if beautiful beaches are all you are after. Hi Mark! These are incredible pictures of the coastline! Thanks so much for reading my posts about Slovenia and commenting. :) YES we will definitely return and we thoroughly enjoyed it - in spite of the accordian music. :) I should have added that the owners gave us a huge jar of the honey they made themselves on the farm to apologize for the noise and it is delicious - it all turned out well. :) We had a great time and you have a BEAUTIFUL country!! You are more then welcome to drop by my blog again sometime. Mmmm... honey! I also like it very much. My uncle produces some of his own. I must say it is excellent! Pictures are really superb and I just love this blog fantastic. thanks for reminding me about this wonderful time! Such a beautiful place to travel wish to be there. How to find a typical old village on Corfu?